If you're missing that certain sense of adventure when shopping for your next Daily Turismo...that slight feeling of dread and a voice in the back of your head telling you to leave, get out...something isn't right; the transaction could go "sour" at any minute...then we have found the perfect car to check out in full daylight and providing you bring along a buddy as backup. 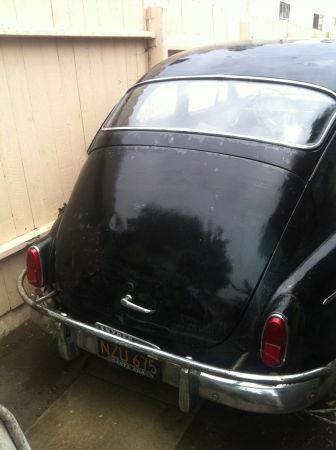 This gem of an ad combines two of our favorite things: craigslist kooks and vintage Volvos. 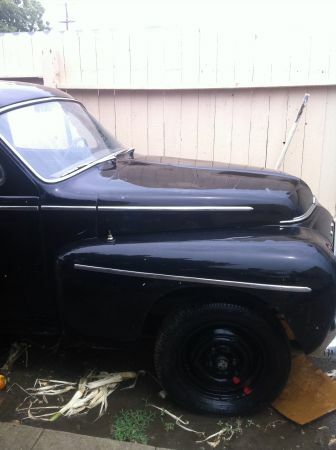 Check out this 1959 Volvo PV544 for sale in Long Beach, CA for $1200. We're not really even sure where to start with this one. The image above is the closest thing to an overall shot provided by the seller. 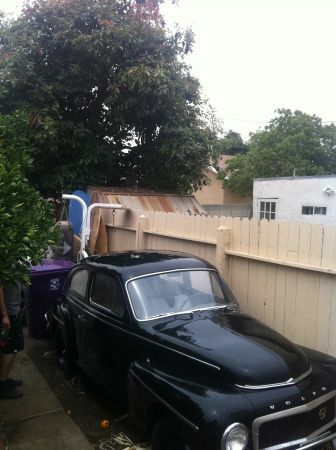 From it, we can see that a) the car looks wet, and the sky is overcast, b) it does appear to be, in fact, a Volvo PV544, and c) that it seems to be stored in a back yard near a citrus tree obscuring some dude and behind the car is purple trash can. Walk around to the back, and rear end of the car appears intact with no major accident damage. And look, a California black plate...meaning that sometime in the mid '60s the car either came to CA from out of state or the original '59 yellow plate was replaced for some reason. Things seem fairly normal back here. This could be a good deal for $1200! But then you take a look inside, and this is where things start to go wrong. 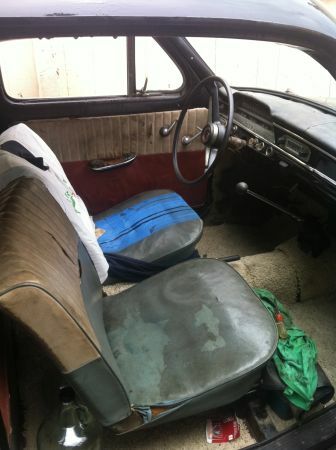 The carpet has been replaced with a remnant from the living room of the abandoned meth house down the street, and the seller's dirty t-shirt collection is displayed partly on the driver's seat back, and partly on the passenger's floor. An empty glass wine jug sits forlornly behind the passenger's seat, waiting for a quick death by recycling, hoping beyond hope that it won't soon become a makeshift bong passed between diseased winos as they hotbox this PV. 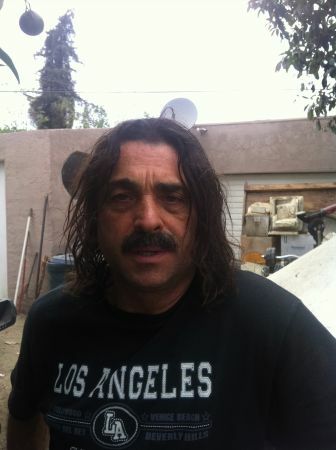 Just as you're starting to look for a way out of the yard, Johnny (the seller) gets uncomfortably close and asks you what year this is, who you are again, and if you'd mind stepping into his house for a minute to help him move his couch. "What are you, about a size 8?" RUN!! In all seriousness, this is one of the most disturbing ads for a genuinely cool, cheap vintage car we have ever seen. The original ad copy is reproduced below for posterity, minus phone number. No information about the car is given other than year, make, model, and price. And please, please do not tell this guy that Daily Turismo featured his car, if you do call him (don't bother emailing apparently). We are afraid of Johnny. Very afraid. no emails as i do not check my email ever. my answering machine is not working so if i do not answer just call back until i answer the phone." ~ only one post with Death by Stabbing label today?
. com'on guys, it's time to step up yer game. this ad been up for months,I sent it in for Halloween but I guess it ended up in the spam folder. I laughed so hard and now again. p.s. :seriously take a buddy and some pocket knifes with you. A full hazmat suit wouldn't hurt either. LAAS: What do you want to see? 5k: 1960 Ford Falcon 2dr Wagon; Ansel Adams! 5k: 1966 Volvo Amazon 122S; Thorsday Custom!